April 4, 2019 There’s little doubt about it: I.P.A. is the style of beer at the very forefront of the world of craft. From theWest Coast-style I.P.A.to the New England I.P.A. — and each creamy milkshake iteration or doubled-up hop-bomb in between — every craft brewery has at least one type of India Pale Ale among its year-round taproom offerings. To explore the concept of “sessionability” in I.P.A. — and whether it’s achievable — we reached out to the authoritative voice on the subject,Mitch Steele. Steele is the former Brewmaster forStone Brewing Co., the largest craft brewery in Southern California, and now serves as Brewmaster and COO atNew Realm Brewing Companyin Atlanta, GA.
Oh, and Steele is also the author ofIPA: Brewing Techniques, Recipes and the Evolution of India Pale AleforBrewers Publications, so yeah, we went to the right source. What is I.P.A.? If you’re reading this article, chances are you’re past the 101 level, but here’s the shortened version for a little refresher: India Pale Ale was developed in England in the 1700s and 1800s. It was shipped to India, where it was received by English and Scottish troops. What separates an I.P.A. from other types of ales and pale ales is the hops, which add bitterness and floral characteristics. Related reading:Meet the Hops in Beau’s Full Time I.P.A. What’s a session beer? “It’s a beer that you can have more than a pint of,” says Steele, “and not feel satiated.” Essentially, you can drink a few pints and not feel too full or too inebriated. “Most people regard session beer as anything less than five percent alcohol by volume,” he adds. How do they brew it? According to Steele, the hardest thing about brewing a session I.P.A. is making sure that there is balance in the beer’s flavour. Fewer malts and grains are used per barrel in the process of making a lower-alcohol beer, so when brewing a session I.P.A., there’s a greater risk of a resulting beer that is too hoppy, and tastes like nothing but hops and water. So session I.P.A. is definitely a challenge. When asked who gets it right, without hesitation, Steele points toFounders Brewing Co.’s All Day IPA. Did you know?Beau’shas a brand-new session I.P.A., Good Time. We asked ourBrewmaster, Matthew O’Harato tell us a little about it. Interested in learning more about beer? Find more of my stories like this one atbeaus.ca/blog — includingSour Beer: A Primer,Brewer’s Yeast: The employee that works 24 hours a day,What is gruit ale?and more. 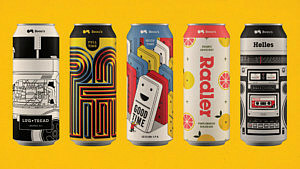 More about Good Time:Meet Good Time, the new session I.P.A. from Beau’s.